Lyon has three universities, but Lyon 1 (Claude Bernard), Lyon 2 (Lumière) and Lyon 3 (Jean-Moulin) were not always the higher education establishments as we know them today. At that time, the faculties were managed independently of each other. Following the Liard Act of 10 July 1896, Lyon’s faculties were grouped together to form the University of Lyon. Around the same time, construction of the university buildings located on Rhone’s left bank was completed and the Palais de l’Université was inaugurated on 1 May 1896 by President Felix Faure. In the early 1900s, the university employed 64 professors, 5 assistant professors, 32 associate professors and 2500 students. The Edgar Faure Act of 12 November 1968, concerning the direction of higher education, awarded universities a new kind of autonomy. Following the by-law of 5 December 1969, the University of Lyon 2 was born regrouping the faculties of arts, law and humanities. The following December, the University of Lyon 1 was created regrouping the faculties of science, pharmacy and medicine. Finally, on 26 July 1973, the University of Lyon 2 was divided to create Lyon 3. Université Claude-Bernard Lyon 1 comprises several sites, such as Grange Blanche and the la Doua Campus in Villeurbanne. Every year, it receives and instructs some 40,000 students and awards over 8000 diplomas, with the help of its 2700 research professors. 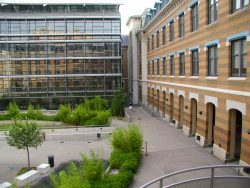 Université Jean-Moulin Lyon 3 has several sites, including its most famous on the banks of the Rhone and another site in the city’s former tobacco factory. Each year, it receives over 26,000 students and has 18 research units. Generally speaking, all of these universities offer courses in the following subjects: health, technology, science, literature, economics, law, psychology and arts. Why study in the Lyon area? The Lyon area is great for students. It offers a great quality of life and great travel infrastructure, such as public transport (tramway, metro, bus), rail links (regional and high-speed trains), and flights (Saint Exupery Airport) for young people who want to get about within the Lyon area, visit the Auvergne-Rhône-Alpes region, travel around France or explore the world! Lyon is home to over 15 student associations that organise exchanges between French and foreign students, such as the association of students of African cultures and the Auvergne Rhone-Alpes association of French Polynesian students, among others. The city of Lyon is the 2nd largest employment area in France. It offers prominent professional opportunities (internships, professional development) for graduates. This dynamic can be explained by the presence of major companies such as Renault Trucks, Bayer SAS and Sanofi Pasteur. Looking for new talents in Lyon, contact us !